who have been treated with Colour Healing. 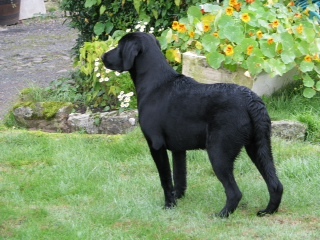 In the Spring of 2014, my 6 year old black Labrador, Cobweb, developed epilepsy. The vet was honest and said "the drug for epilepsy has as bad side effects as epilepsy". The reason Cobweb had succumbed to epilepsy was because 3 years previously, she had been attacked by a pitbull. With the aid of a bucket of water over the pitbull, it took 20 muinutes before he released his jaws. 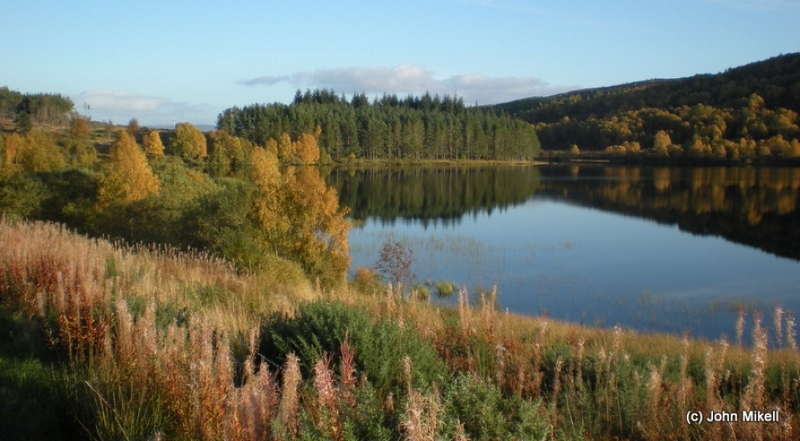 I contacted a friend, Catherine O'Driscoll, whom I knew had been invited to attend one of John's Colour Healing Courses in Inverness and borrowed Catherine's lamp and colour filters. Following the instructions, Cobweb was treated by colour and successfully healed. This was confirmed by Archangel Gabriel. We received a phone call one day to say that there was a 7 year old Yorkshire Terrier who had been taken to the Vet to be put to sleep because of a serious chronic skin condition. Were we interested in taking on this dog ...? You bet we were...! When we saw Misty, her back was almost bare of hair and there was a dreadful smell from her coat which was in desperate need of attention. 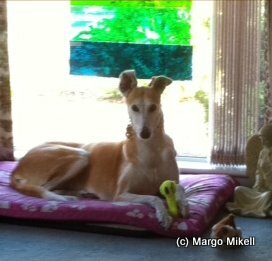 However, she is a lovely little dog and when we introduced her to our Greyhound, Becky, they seemed to get on quite well together. Misty came with a pack comprising of: antibiotics, steroids and a very expensive dog food (which was for skin conditions) plus two special shampoos and a topical skin treatment. Immediately, Misty was given Colour Healing which she thoroughly enjoyed and she was bathed every second or third day with a Neem Mite Shampoo only. Since her course of antibiotics finished, Misty has been completely off all drug medication and her food consists of a high quality organic dog food which she loves. Misty also suffered some emotional problems as well as physical ones and has been treated with the Colours for each condition. Very quickly, Misty settled into her new environment and just loved the effects that Colour Healing was having on her little body. Within two weeks, we could actually see the changes taking place all due to the various colours she was given. We now have a very happy and lovely little Yorkie. COCO is my lovely house rabbit. She was 5 months old when she was spayed. I had no idea how big an operation this was for a little rabbit until the Vet said she has to spend a whole day at the surgery. He then went on to explain the risks and complications that could occur. I left CoCo early in the morning at the Vets and went home to sit and worry. At 4.30pm I received a call to collect her. The Vet said she had recovered from the anaesthetic and could go home but I must observe her closely to ensure her digestive system and bowls returned to normal function. If this did not happen, CoCo must be returned to Vet as soon as possible. The next three days were terrible as CoCo became more miserable - not eating or poo-ing. The Vet gave her a last injection to stimulate the digestive system. If that didn't work, CoCo would die. I was distraught. 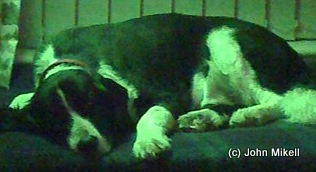 I then decided to use my Colour Lights which had worked so well on friends and their 2 cats plus a hyperactive dog. Realising the area affected would benefit from the Colour Orange, I set up the lights where CoCo had crawled into a corner, obviously in pain. Within seconds she crawled away as the Orange appeared to be too strong for her. 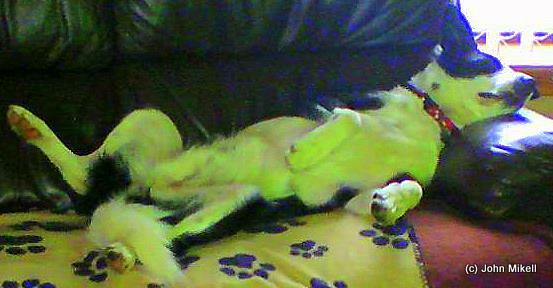 I then tried the Yellow Light, which I had used successfully on a puppy that had swalled feathers from a duster! I placed this Light where CoCo liked to rest but at first she wasn't interested; then she moved to a position where the Yellow shone on her. The revelation came when CoCo wriggled herself into a position where the colour was shining directly onto the wound. CoCo lay there for a very long time and she seemed to gain some energy and began to move more, hopping into her bed area. I left the light on continually and watched as CoCo would go and lie or sin in front of it. Within two days, CoCo was acting normally, eating, poo-ing and getting up to mischief, eating flowers after topping the vase. I took her back to the Vet for a check on the wound and he was amazed at how quickly it had healed. After this, CoCo would often go and just sit relaxing under the Yellow light. Coco is now two years old and still gets interested when she seems me assemble the lights in my Therapy Room. 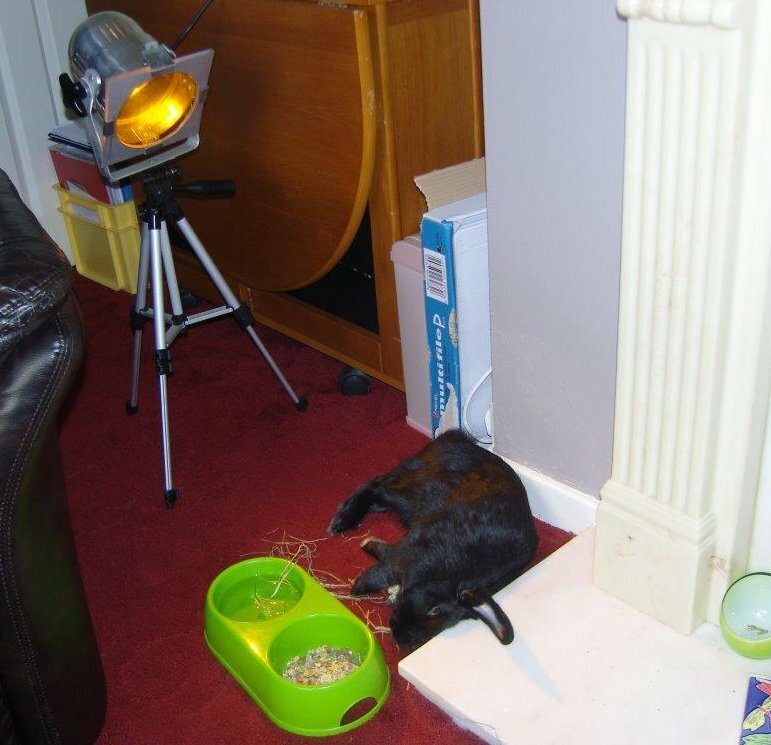 Since this success, a friend, who also has a small elderly rabbit has used my Colour Lights to help her rabbit recover from digestive problems. He also chose to accept the Yellow colour. TOFFEE was a Lurcher/Greyhound Cross who was found as a stray when she was approximately 4 years old. We were so fortunate to have Toffee as she was such a lovely, kind and gentle soul who kept in very good health. At one point when she was 11 years old, she just didn't seem quite herself so it was decided to get our Vet's opinion of her. A full examination was carried out on Toffee but proved to be inconclusive so a complete scan was recommended and was carried out the following day. The results were quite surprising as they showed that Toffee had Spondylosis, Pancreatitis, Enlarged Lymph Nodes and an Enlarged Heart. Our Vet recommended various drugs which would help to support Toffee but we said we would like to use Colour Healing first before using drugs. Our vet agreed on the condition that Toffee received another scan in a month's time. On arriving home from the Vet, John immediately set up a Colour Healing Lamp dedicated to the area where Toffee's bed lay. 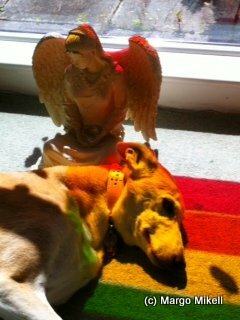 This meant that each time Toffee lay in her bed, Colour Healing was administered to her body which she just loved and responded to. As promised, we returned to the Vet for a further scan to check on Toffee's progress. Our Vet was absolutely amazed at the obvious difference in Toffee and, on examination, we were told that there was no sign whatsoever of the Spondylosis, Pancreatitis, Enlarged Lymph Nodes or Enlarged Heart...! We were asked about the treatment we had given Toffee and explained that it was ONLY COLOUR...! Our beloved Toffee lived another two years completely free of pain and suffering and we miss her terribly. STORM is a 14 years old Collie Cross and has enjoyed Colour Healing on several occasions when John & Margo kindly looked after him while we were on holiday. Storm's eyes were getting increasingly cloudy and he was becoming a bit old and stiff. 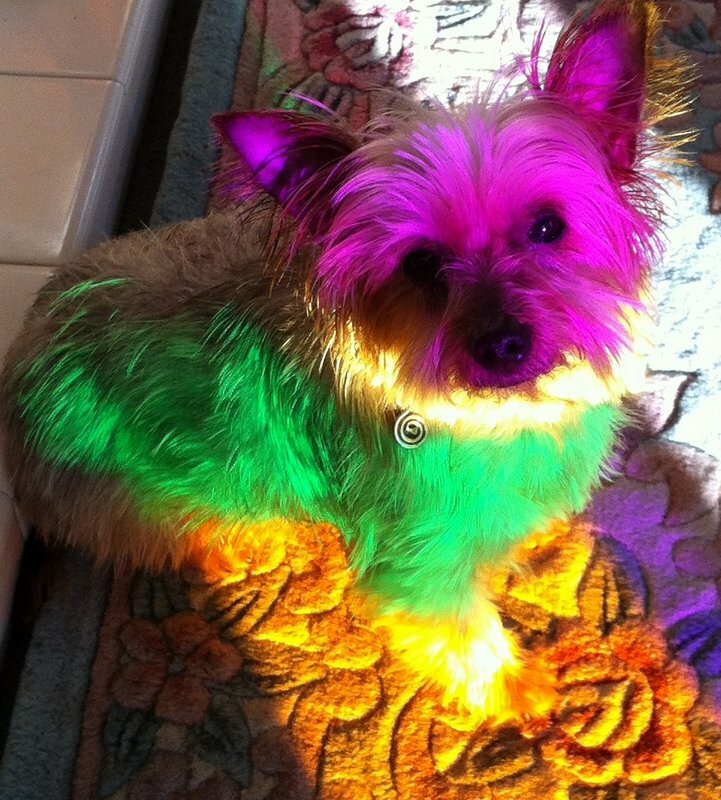 Leaving him with John & Margo meant that he would get plenty of Colour Healing. When I returned to collect Storm, the difference in his cloudy eyes and general mobility was very obvious - all thanks to the Colour Healing. SAMYE is a 3.1/2 year old collie who came to us from the SSPCA. He was very much a gangly puppy who looked younger than his 5 months. We had difficulty in trying to keep weight on him but initially thought this was because he was so active. However, when he reached one year old, he was diagnosed with EPI and had to start taking medication. Ten months later, Samye was diagnosed with diabetes resulting in daily injections of insulin - at this time, his weight was 14.3 kilograms. The next few months proved difficult especially as Samye's weight dropped to its lowest and worrying 13.4 kilograms. Numerous vet visits were necessary to take blood samples trying to get the correct insulin balance. Unfortunately, but understandably, Samye found these visits extremely stressful and upsetting. It was at this point that John introduced the concept of Healing With Colour to improve Samye's health. In January 2010, we started with colour treatments (twice daily for the first few months) and Samye really enjoyed being under whichever colour John recommended for him. The photograph shows just how much he enjoys his colour treatments and in fact we think he actually looks forward to them. This last year has been somewhat stressful us especially with the ups and downs of getting not only the insulin balance correct but also his diet. We are so delighted that Samye now weighs a very healthy 19.5 kilograms, much to the delight of all concerned with his health. 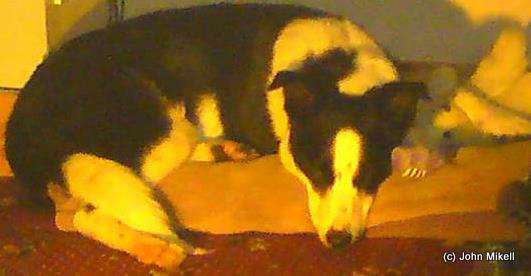 We no longer think of Samye as a poorly boy but a very healthy and happy one. Mr & Mrs S, Highland Region. 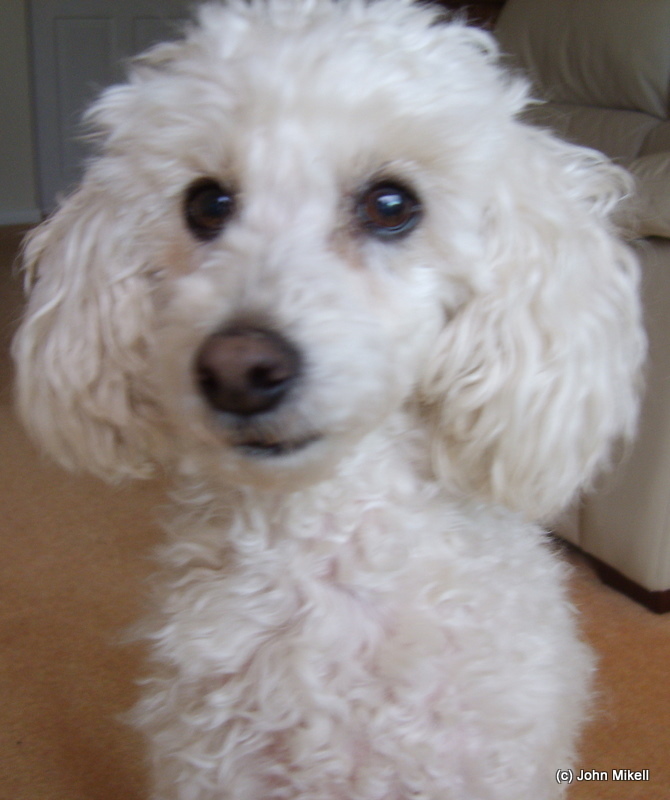 My name is ABBY and I am an 11 year old Poodle who is adored by my wonderful and considerate owners. I have suffered with ill-health since puppyhood. In 2010 I started shaking my head violently and was diagnosed by the vet to have Pseudomonas Aeruginosa and she said that there was no known solution to this condition. This bacterial infection is also harmful to humans. Many courses of strong antibiotics did not alleviate the symptoms, so they were discontinued. My owners became so frustrated with lack of progress that they contacted John to help using Healing With Colour. After many months of various colours, which were used daily, my owners took me back to the vet who was amazed to find that the condition had cleared. I am enjoying life as never before and my owners cannot give enough gratitude to Healing With Colour.